Gazelle is running a couple of trade-in promotions at the moment. Good until 5/27/18, you can get a $25 trade-in bonus when you trade in a MacBook valued at $250+. Separately you can get a $15 trade-in bonus when you trade in a iPhone valued at $150+. Check their website for terms, conditions and details. New Sony Instant Savings are LIVE: a7 for $800, a7 II for $1100, w/28-70 for $1300, a7r II for $2400, APS-C a-Series, Lenses and More! A new round of Sony Instant Savings is now up and running at B&H Photo, some of them also get free promotional rewards and/or free accessories. The price you see is the price you pay, no coupons, no rebates. 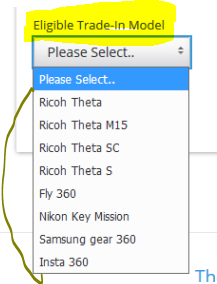 + there is a long list, hit the “Load More” at B&H Photo to see them all. In parallel, B&H Photo is also running a Sony Trade-IN Promotion. The trade-in promotion will run until 3/31/18. The Trade-IN Bonus will depend on which camera you trade-in, it ranges from $200 to $500 depending on which Sony a-camera you trade-in. The trade-in bonus is in addition to the actual used value of the camera. So if your used camera is worth $400 and it is eligible for the $500 trade-in bonus, you will get $500 towards the purchase of a new eligible Sony camera, and a $400 check for the actual value of your used camera. Heads Up: Sony Sale and Trade-IN Offers start Sunday! If you are interested in buying Sony camera gear, or trade-in your camera gear, or even switch to Sony, this is a heads up for you! Starting on Sunday 2/4/18 at 12:01am eastern, a new Sony Sale along with a Sony Trade-IN Promotion. The trade-in promotion will run until 3/31/18. The Trade-IN Bonus will depend on which camera you trade-in. Olympus is running a trade-in promotion at B&H Photo and other dealers that give you a Trade-IN Bonus towards the purchase of select Olympus M43rds cameras and lenses. Eligible cameras to purchase with this promotion are the E-M1 II, E-M5 II, PEN-F, and E-PL8. Nine Olympus M43rd Prime lenses are also eligible. You will ALSO receive the trade-in value of the cameras you turn in for the trade-in promotion. So, for example, if you are buying the Olympus E-M1 II body only through this promotion. The camera’s current price is $2000. If you participate in the trade-in promotion, you get a $300 off trade in-bonus discount. So you pay $1700 for the camera. You will also receive the trade-in value of the camera you turn it. For example, if you trade-in an old beat-up DSLR, you may get a $100. If you trade-in a recent pristine DSLR, you may get a $500 value. The numbers I’m using here are strictly for example purposes, not based on current market prices! When you click on the “Start your Trade-In” links over at the trade-in promotional page, you will see a list of eligible camera and lenses for this promotion. If you are interested in buying the Fuji GFX-50S medium format camera body-only kit in new condition, AND you have a serious DSLR or mirrorless or medium format camera you are willing to part with, Adorama has a Fuji GFX-50S Trade-In Promotion. You can only trade-in one of the cameras listed in the aforelinked promotional page. They are serious cameras, for example, among Canons, it starts with the 6D and goes up to the 1D*; among Nikons it is D600 and up, among Sonys it is Sony a850/900, a7* and up, and so forth. Some medium format cameras are also eligible. See the complete list in this PDF file (direct link to PDF file). If you are interested in the new Hasselblad H6D models and have older models you are willing to part with, Hasselblad is running a trade-in promotion that gets you discounts towards the purchase of the H6D-50 and H6D-100 models. The discount varies by model, but it’s better than 50% of the new model price. Some competitor models are also eligible for the trade-in promotion. Check with your favorite Hasselblad dealers. They are also offering financing promotions that can be stacked with the trade-in, provided by Madison Capital. A total of three cameras and three lenses are participating, including the E-M1 II with 12-40mm f2.8 which goes for $2700 before the trade-in promotion. If you have older camera gear you are willing to part with, Adorama is having a trade-in promotion that gets you the Olympus Pen-F for $1050 with the trade-in discount factored in the price you pay. The offer is available for both the black Pen-F and the silver Pen-F.
PS: I haven’t done this trade-in promotion, so I don’t know how it works end to end. Running until 10/31/15, Amazon has a Sony Trade-In Bonus Promotion that can be applied towards the purchase of select Sony a7* kits or FE lenses. The complete list of eligible cameras and lenses is shown over there. The “bonus” part of the trade-in is this: in addition to the actual trade-in value of the camera gear you will send them in, you will also receive a promotional code that gets you $45 to $250 off the purchase of the aforementioned Sony a7* cameras or FE lenses. In general, the higher the price of the item, the bigger the promo code discount. For example, the a7S body only gets $250 off, while the 28mm f2 gets $45 off. You receive promo codes for all 17 eligible items. You can use each promo code once. Applies only to items sold and shipped by Amazon herself (not 3rd-party sellers). STEP #1: locate the camera(s) or lens(es) you want to trade-in. The promotional page has big pictures for eligible “Digital SLRs” or “Mirrorless Cameras” or “Lenses”. Once you hit one of those links, you will see eligible products. You don’t have to go through them page by page. 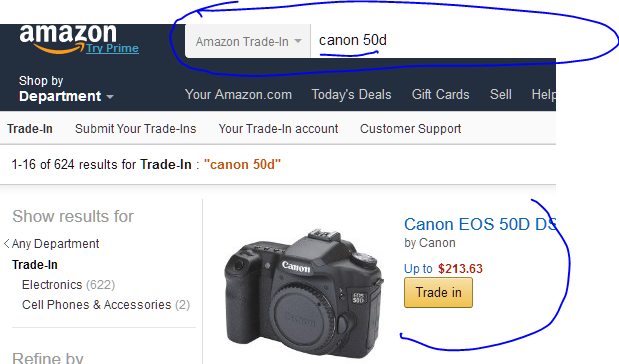 The Amazon search box over there morphs into a trade-in search box, so it will only show you eligible items. So, for example, you don’t have to go through 500+ DSLR kits to see if yours is eligible. STEP #2: select the camera you want to trade-in and follow the steps. It’s easy actually. You click the yellow “Trade-In” button and it shows you price ranges depending on the condition. Your trade-in amount will be adjusted if when they receive it, their evaluation of the item’s condition differs from your own. Even so, you have some control, you can pre-select whether you want them to return the item to you for free, or automatically accept the lower price. (if the price is higher, they’ll obviously give you a bigger trade-in amount). The trade-in amount will be sent to you in an Amazon Gift Card, not a cold-hard-cash check/cheque. STEP #3: if you accept the offer, you ship your old camera/lens to Amazon for FREE using their printable shipment labels. About 7-10 business days after, you will receive via e-mail the promotional codes that go towards the purchase of Sony a7* or FE lenses. The promotional codes are pre-determined amounts ($45 to $250) depending on which Sony item you buy in the future. These amounts are not linked to the value of your old used traded-in gear. STEP #4: after your old used trade-in gear is received by Amazon, and their condition evaluated, you will receive an email with their findings, and if accepted by them, you will receive your trade-in value in an Amazon electronic gift card (this is a never-expiring Amazon gift card, not a promotional code). STEP #5: you can use both the promotional bonus codes ($45 to $250) and your trade-in gift card towards the purchase of a Sony camera or FE lens. This is optional. You don’t have to buy anything. But obviously you can’t undo the trade-in once it is submitted and accepted by Amazon and it survives your “lower condition” conditional choice in Step #2. DEADLINES: The promotion expires 10/31/15. The promo codes expire 11/7/15. Adorama is running another Trade-In Promotion good until 10/31/15. You trade-in one digital interchangeable-lens camera or lens, and receive a trade-in bonus of up to $250, in addition to the trade-in value of your gear. The trade-in bonus can be used towards the purchase of a new Sony a7 series digital camera or full frame E-mount. Per the short instructions there, you fill in the short form on their website. Then they give you a trade-in code. You use that towards the purchase the a7 series camera or FF E-mount lens of your choice. In parallel, you send them your old camera/lens you agreed to trade-in. Amazon is running a Trade-In Promotion for the Sony RX10 and RX100* digital cameras. You trade-in a qualifying camera or camcorder or smartphone. Three business days later, you will receive an email with a promotional code for either $50 off the RX100* cameras or $100 off the RX10 camera. One trade-in promo code per order. Only new condition RX10/RX100* cameras sold by Amazon herself are eligible (not 3rd-party sellers, not used/refurbs). This promotion ends 3/28/15. More details over there. UPDATE #1: Adorama has a Sony RX Trade-In promotion as well. UPDATE #2: B&H Photo has a Sony RX trade-in promotion as well. If you are interested in getting one of the Sony a7* camera kits or FE lenses, and you have a working DSLR or mirrorless camera you no longer need, B&H Photo has a brand new Trade-In Promotion. You will receive a 15% credit (of the price of the participating Sony a7* camera or FE lenses) plus the actual value of the camera you trade-in.